A little visual sauce from Meeshi, a freelance photographer. It’s that time of year again, Valentines Day is right around the corner. 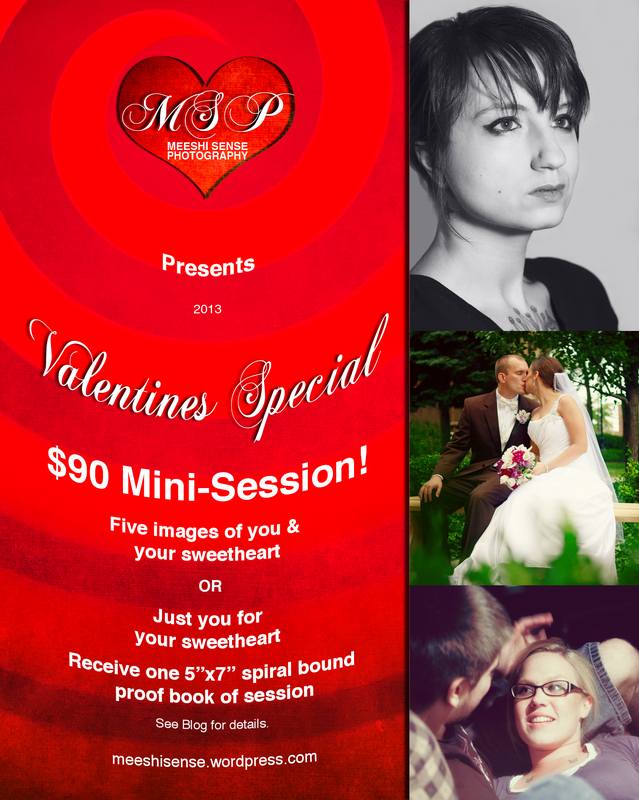 This year MSP is offering standard portrait mini-sessions, Standard portrait covers classic and creative portraits. You may choose the location within 50 miles of my office in Byron for your mini-session any time between February 2nd-14th. Additional travel fee’s will apply if your location is outside the designated area. Shoot time is unlimited, though in general, mini-sessions are short in duration and often do no consume too much time. Your images will be viewable within 14 days of the mini-session, depending on your creative editing requests and volume of response to this offer. A private digital gallery will be created and emailed to you with password and your print proof book order will be placed. Once the proof book reaches my office it’s packaged boutique style and shipped to you. Use your digital image gallery and print proof gallery to help guide you in your print product purchase choices. Of course, I will always be available for selection assistance if requested. MSP has a $300 minimum order requirement, which includes the session and prints. The mini-session allows you to purchase more prints while saving money on the session at the same time. Your print order is required within two weeks of receiving your print proof book to qualify for print packages (savings). Orders placed after the two week time frame are restricted to á la cart menu. Bookings must be made no later than Feb 2st. Latest available session date for mini-session price is Feb 15th. A non-refundable booking fee of $45 is due at time of booking. Your booking fee will be applied to you balance of $45 due at the time of the session. Maximum people per session is two. All five high resolution images, full size as well as common print ratio’s versions, for each digital copy, labeled for easy crop-free printing. Images used for for social media purposes must contain a provided copy with MSP copyright information. Images are supplied on a custom printed CD with a custom printed CD case. Shipped to your home in boutique style and shipped to you. Click here to download the MSP Rates PDF. Side note* It has been reported to me that google drive wont let you scan the file previous downloading. Please note I scanned the file previous upload and it is clean, also for any additional peace of mind you can scan the file with your own virus protection before opening it, which is when the damage would take effect were a file infected.